Each major software category contains -more specific subcategories of software. So, for example, the Software Infrastructure category contains subcategories such as Application Development, Databases & Caching, and Operating Systems. 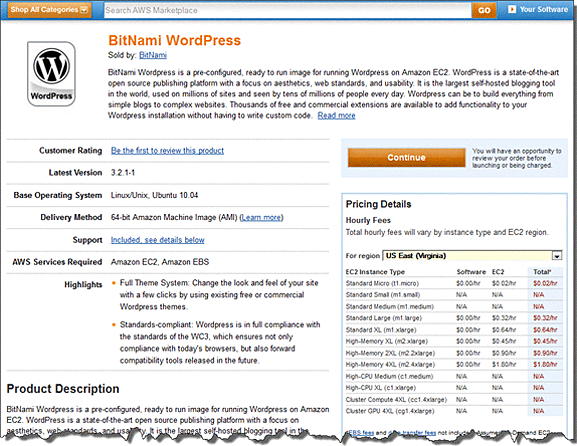 Software is available as either Amazon Machine Images (AMIs) or as Software as a Service (SaaS). 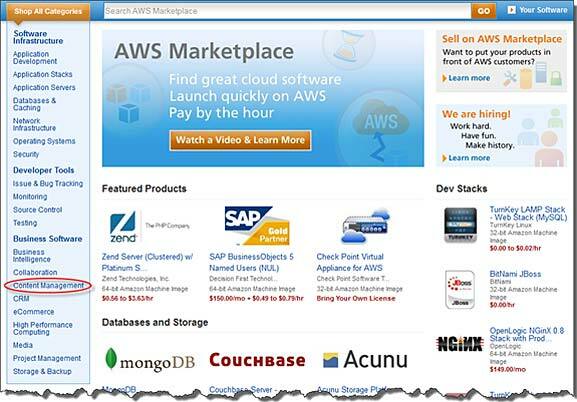 For information on the differences AMIs and SaaS, go to AWS Marketplace Products. Go to https://aws.amazon.com/marketplace. The Shop All Categories pane contains the list of categories you can choose from. You can also choose software featured in the middle pane. For this walkthrough, in the Shop All Categories pane, click Content Management. From the Content Management list, click BitNami Wordpress. If you chose a SaaS solution, you can click Visit Site to get more information and to sign up. After you complete step 1, you will be directed to sign into the AWS Marketplace. If you already have an AWS account, you can use that account to sign in. If you don't already have an AWS account, use the following procedure to create one. When you create an account, AWS automatically signs up the account for all AWS services. You are charged only for the services you use. From the Sign In or Create an Accountpage, click Create a New Account. As part of the sign in procedure you will receive a phone call and enter a PIN using your phone keypad. If you chose your software as an AMI, your next step is to launch an Amazon EC2 instance running the software product you've subscribed to. Subscribing to a product means that you have accepted the terms of the product. If the product has a monthly fee, then upon subscription you will be charged the fee, which will be prorated based on the time remaining in the month. No other charges will be assessed until you launch an EC2 instance with the AMI you have chosen. Before you launch your Amazon EC2 instance, you need to decide if you want to launch with 1-Click Launch or if you want to launch using the Amazon EC2 console. 1-Click Launch helps you launch quickly with recommended default options such as security groups and instance types. With 1-Click Launch, you can also see your estimated monthly bill. If you prefer more options, such as launching in an Amazon Virtual Private Cloud (Amazon VPC) or using Spot Instances, then you should launch using EC2 console. The following procedures walk you through subscribing to the product and launching an EC2 instance using either 1-Click Launch or the EC2 Console. Expand Version, and select the AMI version you want. Expand Region, and and select the region you want from the list. Expand EC2 Instance Type, and click an instance type. You will see the pricing information change under Pricing Details to match your selection. You can also review the Monthly Estimate in the right pane. Expand Firewall Settings, and click an existing security group, or click Click new based on seller settings to accept the default settings. For more information about security groups, go to Using Security Groups in the Amazon Elastic Compute Cloud User Guide. Expand Key Pair, and click an existing key pair if you have one. If you do not have a key pair, you will be prompted to create one. For more information about Amazon EC2 key pairs, go to Using Credentials in the Amazon Elastic Compute Cloud User Guide. When you are satisfied with your settings, click Accept Terms & Launch with 1-Click. 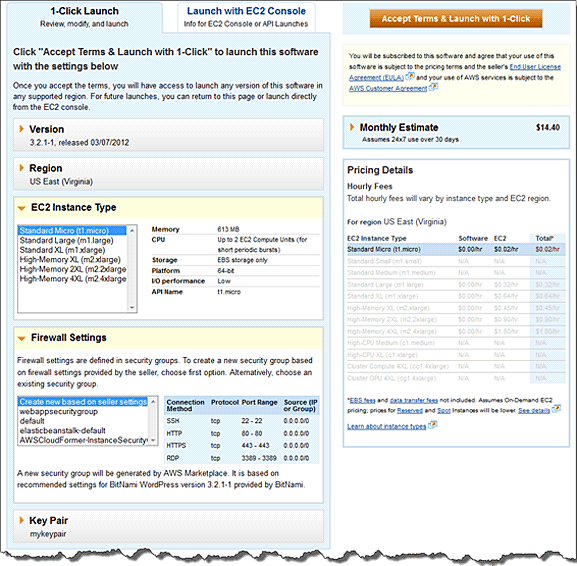 On the Launch on EC2 page click the Launch with EC2 Console tab, and then select an AMI version from the Select a Version list. Review the Firewall Settings, Installation Instructions, and Release Notes, and then click Launch with EC2 Console. In the EC2 console, you will launch your AMI using the Request Instance Wizard. Follow the instructions in the Amazon Elastic Compute Cloud (Amazon EC2) Getting Started Guide to navigate through the wizard. Go to https://aws.amazon.com/marketplace, and click Your Software. You can use the Your Software page to mange your software subscriptions. When you've decided that you no longer need the instance, you can terminate it. You cannot restart a terminated instance. However, you can launch additional instances of the same AMI. On the Your Software page, next to the instance you want to terminate, click Manage in AWS Console. In the AWS Management Console, open the EC2 console, right-click the instance, and then click Terminate. Click Yes, Terminate when prompated for confirmation. Amazon EC2 begins terminating the instance. As soon as the instance status changes to shutting down or terminated, you stop incurring charges for that instance. For more information and help using AWS Marketplace, go to Help. For more information about Amazon EC2, go to the product documentation at http://aws.amazon.com/documentation/ec2/. To learn more about AWS, go to https://aws.amazon.com/.